Burnham is the finest scout who ever scouted in Africa. He was my Chief of Scouts in '96 in Matabeleland and he was the eyes and ears of my force. Burnham after his investiture with the cross of the Distinguished Service Order by King Edward VII. The black armband was worn in mourning for the recent death of Queen Victoria. London, 1901. I take this opportunity of thanking you for the valuable services you have rendered since you joined my headquarters at Paardeburg last February. I doubt if any other man in the force could have successfully carried out the perilous enterprises on which you have from time to time been engaged demanding as they did the training of a lifetime, combined with exceptional courage, caution, and powers of endurance. Returning from the Boer War on the RMS Dunottar Castle, July 1900. Burnham standing, third from left. I know Burnham. He is a scout and a hunter of courage and ability, a man totally without fear, a sure shot, and a fighter. He is the ideal scout, and when enlisted in the military service of any country he is bound to be of the greatest benefit. To my friendly enemy, Major Frederick Russell Burnham, the greatest scout of the world, whose eyes were that of an Empire. I once craved the honour of killing him, but failing that, I extend my heartiest admiration. To the Memory of the Child: Nada Burnham, who "bound all to her" and, while her father cut his way through the hordes of the Ingobo Regiment, perished of the hardships of war at Buluwayo on 19 May 1896, I dedicate these tales—and more particularly the last, that of a Faith which triumphed over savagery and death. Burnham in real life is more interesting than any of my heroes of romance! ^ According to McClintock and other sources, Burnham's father was a Congregational minister; Burnham latterly wrote of his father as a "Presbyterian preacher". In Edwin Burnham's time, Presbyterians and Congregationalists cooperated in establishing many new congregations in the Midwestern United States. "Presbygationalists", as these congregations were sometimes known, were allowed to choose either a Presbyterian or a Congregational pastor. ^ According to Lott, Burnham was drawn into the conflict by his association with the Fred Wells and his family; Money states that it was the Gordon Family. In his memoirs, Scouting on Two Continents, Burnham never gives the name of the family, but in the undated manuscript he mentions his friendship with young Tommy Gordon and his family from Globe. ^ The Ndebele people's term for themselves in their own language is amaNdebele (the prefix ama- indicating the plural form of the singular Ndebele), whence comes a term commonly used in other languages, including English: "Matabele". Their language is called isiNdebele, generally rendered "Sindebele" in English. The area they have inhabited since their arrival from Zululand in the early 1800s is called Matabeleland. In historiographical terms, "Matabele" is retained in the names of the First and Second Matabele Wars, the former of which the Shangani Patrol was a part. For clarity, consistency and ease of reading, this article uses the term "Matabele" to refer to the people, and calls their language "Sindebele". ^ Hales, Van Wyk, and Britt all provide slight variations on this quote. The quote cited here comes from a facsimile of a handwritten letter from Lord Roberts to Major Burnham. The complete text of the letter is as follows: "Army Head Quarters, Pretoria, June 25, 1900. Dear Major Burnham, As you are about to return to Europe, I take this opportunity of thanking you for the valuable service you have performed since you joined my head quarters at Paaderburg last February. I doubt if any other man in the force could have successfully carried out the perilous enterprises on which you have from time to time been engaged demanding as they did the training of a lifetime, combined with exceptional courage, caution and powers of endurance. I was sorry to hear of the serious accident you met with in your last successful attempt on the enemy's line of railway, and I ____ to hear that you are quite well again. Believe me your _____ Roberts"
^ Davis 1906, p. 192. ^ West 1932, p. 49. ^ a b c Illustrated London News 1902, p. 44. ^ The Times 1926, p. 10. ^ a b Burnham 1926, p. 1–2. ^ a b McClintock 1885, p. 692. ^ a b Burnham & n.d, p. 6. ^ Hamilton College 1874, p. 53. ^ New York Evangelist 1855, p. 58. ^ Smylie 1996, p. 72. ^ Burnham 1926, p. 1. ^ Russell 1941, pp. 1–8. ^ Davis 1906, p. 197. ^ Burnham & n.d, p. 18. ^ a b c d e f International News Service 1915, p. 241. ^ Burnham 1926, pp. 4–6. ^ Burnham 1926, p. 6. ^ Carr 1931, p. K10. ^ a b c Bradford 1993, p. xi. ^ West 1932, p. 117. ^ Burnham 1926, p. 13. ^ West 1932, p. 98. ^ Burnham 1926, p. 15. ^ Burnham 1926, p. 12. ^ West 1932, p. 96. ^ Lott 1981, pp. 82–7. ^ Money 1962, p. 331–2. ^ Lott 1981, pp. 80–1. ^ a b c d e f Money 1962, p. 331–6. ^ Burnham 1926, Chapter III. The Tonto Basin Feud. ^ Burnham & n.d, p. 95. ^ Burnham 1926, p. 26. ^ Burnham 1926, p. 27. ^ Burnham 1926, pp. 27–8. ^ Burnham 1926, pp. 27-31. ^ Burnham 1926, p. 31. ^ Burnham 1926, p. 63. ^ Bradford 1993, p. xii. ^ Nash 1980, pp. 98–100. ^ Davis 1906, p. 191. ^ West 1932, pp. 51–4. ^ Lott 1972, p. 193. ^ Marston 2010, p. v.
^ West 1932, p. 55. ^ Donovan 1894, p. 271. ^ a b Forbes et al. 1896, pp. 110–119. ^ Hensman 1900, p. 105. ^ Hensman 1900, pp. 105–8. ^ Wills & Collingridge 1894, p. 153–172. ^ Gann 1965, p. 118. ^ Forbes et al. 1896, p. 110. ^ Hensman 1900, pp. 49–51. ^ O'Reilly 1970, pp. 76–79. ^ O'Reilly 1970, p. 77. ^ Lloyd's 1899, p. 9. ^ a b Kemper 2016, p. 376. ^ Davis 1906, p. 210. ^ a b Burnham 1899, pp. 177–180. ^ Baxter 1970, p. 67. ^ The Times & May 9, 1899, p. 3. ^ Burnham 1926, p. 211. ^ a b Hough 2010. ^ Lott 1972, p. 198. ^ Juang 2008, p. 1157. ^ a b Lott 1981, p. 90. ^ Selous 1896, pp. 220–22. ^ a b West 1935, p. 146. ^ a b West 1932, p. 137. ^ Burnham 1926, p. 253. ^ a b New York Times 1896, p. 4. ^ Leebaert 2006, p. 379. ^ Burnham 1926, pp. 259, 270. ^ Davis 1906, p. 218. ^ Britt 1923, p. 67. ^ Davis 1906, p. 228. ^ Lott 1981, p. 76. ^ London Gazette 1899, p. 8541. ^ a b Farwell 1976. ^ Burnham 1926, pp. 343–8. ^ Unger 1901, p. 222. ^ Unger 1901, pp. 224–225. ^ Atlanta Constitution 1900, p. 9. ^ Burnham 1926, pp. 309–28. ^ London Chronicle 1901, p. 27. ^ Hales 1900, p. 5. ^ van Wyk 2003, p. 390. ^ a b c Britt 1923, p. 75. ^ Burnham 1926, p. 351. ^ Burnham 1926, pp. 338–48. ^ Finest Hour 2005, p. 28. ^ a b Burnham 1926, p. 353. ^ Los Angeles Times 1900, p. I15. ^ a b Los Angeles Times 1902, p. C9. ^ Bosher 2012, p. 256. ^ a b Shippey 1930, p. A4. ^ New York Times 1901, p. 9. ^ a b Plaster 2006, p. 5. ^ Pegler 2004, p. 129. ^ Poyer 2013, pp. 127, 129. ^ Pegler 2004, p. 131. ^ West 1932, p. 137–8. ^ a b c West 1932, p. 138. ^ West 1932, p. 142. ^ West 1937, p. 472. ^ Jeal 1989, p. 189. ^ Anglo Boer War Museum 2007. ^ Jeal 1989, p. 188. ^ Prichard 1919, pp. 191–193. ^ 1st Lacock Scout Group 2013. ^ Davis 1906, p. 219, 233. ^ a b Coates 2007, p. 100. ^ DeGroot 1944, p. 32. ^ Boy Scouts of America 1933, p. 611. ^ Boy Scouts of America 2012. ^ a b Everett 1952, pp. 117–119. ^ Weideman 2006, p. 6,10. ^ New York Times 1900, p. 2. ^ Baden-Powell 1908, p. 365. ^ Daily Mail 1930, p. 4. ^ van Wyk 2003, pp. 554, 568. ^ Geographical Names Information System 2013. ^ Burnham 1944, pp. xxv–xxix. ^ van Wyk 2003, pp. 536–537. ^ United States Geological Survey 2013. ^ a b c d Lott 1972, p. 201. ^ United States Army 2004. ^ New York Times 1901a, p. WF7. ^ a b Tough 1985, pp. 385–387. ^ Holder 1912, p. 196. ^ Fort 1912, p. 139–40. ^ New York Times 1912, p. 15. ^ a b Hammond 1935, p. 565. ^ Davis 1906, p. 219. ^ a b New York Times 1917, p. 11. ^ Roosevelt 1917, p. 347. ^ New York Times 1917b, p. 1. ^ Pietrusza 2007, pp. 55–71. ^ Burnham 1944, pp. 23. ^ Lott 1977, pp. 67–70. ^ Wood 1932, pp. 313–334. ^ Burnham 1944, pp. 11–23. ^ van Wyk 2003, p. 505. ^ van Wyk 2003, pp. 505,510. ^ Hammond 1935, p. 753. ^ a b Hammond 1935, p. 754. ^ van Wyk 2003, p. 510. ^ laedc 2010, pp. 1–18. ^ New York Times 1910, p. SM5. ^ Washington Post 1911, p. 6. ^ California Fish and Game 1915, p. 123. ^ Fauna of the British Empire 1930, p. 308. ^ Los Angeles Times 1929, p. A3. ^ Scientific Notes and News 1930, p. 536. ^ Colby & Olmsted 1933, p. 144. ^ Thrapp 1991, p. 195. ^ Saxton 1978, pp. 16–18. ^ Arizona Highways 1941, p. 7. ^ Davis 1906, p. 194. ^ West 1932, p. 173. ^ a b c Haggard 1926, Chapter XVII. ^ Davis 1906, pp. 195–6. ^ a b Lott 1977, p. 68. ^ Woods 2012, p. 133. ^ a b Bradford 1993, pp. ix–xxiv. ^ van Wyk 2003, p. 561. ^ Los Angeles Times 1896a, p. 10. ^ van Wyk 2003, p. 422. ^ Los Angeles Times 1927, p. I3. ^ van Wyk 2003, pp. 489–490. ^ New York Times 1932, p. XX8. ^ University of California 2009. ^ Haggard 1896, p. 5. ^ Atlanta Constitution 1896, p. 2. ^ The Western Times 1905, p. 4. ^ a b c Montgomery 1967, p. 71. ^ van Wyk 2003, p. 442. ^ Burnham 1944, pp. 217–20, ch. XXXI. ^ Burnham 1944, pp. 222–232, ch. XXXI. ^ Burnham 1944, p.228, ch. XXXI. ^ Burnham 1944, p.232, ch. XXXI. ^ Burnham 1944, p.217, ch. XXXI. ^ a b Burnham 1884, pp. 246,251. ^ Miraldi 2003, pp. ix,18. ^ Library of Congress 2009. ^ Miraldi 2003, pp. 261–8. ^ Cal Death Index 1982. ^ van Wyk 2003, pp. 560–561. ^ Weideman 2006, p. 5. ^ The Times 1899, p. 1. ^ Barrett & Valiance 1999, p. 125. ^ MacKenzie 1986, p. 97. ^ Barnes 1990, p. 265. ^ Southern Africa 1973, p. 40. ^ Southern Africa 1973, p. 100. ^ Hemingway 2005, pp. 235, 252, 259–261, 270–271, 293, 298. ^ Hemingway 2005, p. 284. ^ Wagner-Martin 2000, p. 16. ^ Birchard 2004, p. 372. ^ Burnham 1926, p. xi. ^ Hammond 1921, p. 275. ^ City of Fulton 2007. ^ Davis 2001, pp. 111, 219. ^ Ehrenclou 1925, pp. 1–11, 19. ^ Osborn 1933, pp. 1–5. This article incorporates public domain material from a 1906 biography of Major Burnham: Davis, Richard Harding (1906). Real Soldiers of Fortune . New York: Charles Scribner's Sons. ISBN 978-0-87364-239-2. Baden-Powell, Robert (1899). Aids to scouting for N.-C.Os. & men. London: Gale & Polden. OCLC 316520848. Baden-Powell, Robert (1884). Reconnaissance and scouting. A practical course of instruction, in twenty plain lessons, for officers, non-commissioned officers, and men. London: W. Clowes and Sons. OCLC 9913678. Barnes, John (1990). Filming the Boer War. Beginnings of the Cinema in England, 1894–1901, v. 4. London: Bishopgate. ISBN 978-1-85219-046-0. Barrett, Cathy J.; Valiance, Heather (October 1999). "The Wild West Show: Socio-historic Spectacle and Characters as Circus". Victoria, Australia: Australasian Drama Studies, La Trobe University. Baxter, T.W. ; Burke, E.E. (1970). Guide to the Historical Manuscripts in the National Archives of Rhodesia. Salisbury, Rhodesia. Birchard, Robert S. (2004). Cecil B. DeMille's Hollywood. Lexington, Kentucky: University Press of Kentucky. ISBN 978-0-8018-6275-5. Bosher, John Francis (2012). Vancouver Island in the Empire. Tamarac, Florida: Llumina Press. ISBN 978-1-60594-827-0. Bradford, Mary E.; Bradford, Richard H. (1993). An American Family on the African Frontier: The Burnham Family Letters, 1893–1896. Niwot, Colorado: Roberts Rinehart Publishers. ISBN 978-1-879373-66-2. Bradford, Richard H. (1984). Frederick Russell Burnham, the British Empire's American Scout. American Historical Society Annual Meeting. Washington, D.C.
Brelsford, W. V., ed. (1954). "First Records—No. 6. The Name 'Rhodesia'". The Northern Rhodesia Journal. II (4): 101–102. Britt, Albert (1923). "Chapter 3. The Last of the Scouts". The Boys' own Book of Adventurers. New York: Macmillan. OCLC 4585632. Bryant, H. C. (April 1915). "Organizations Defending Wild Life". California Fish and Game. ISSN 0008-1078. Burnham, Frederick Russell (January 8–9, 1895). 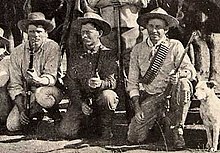 "Shangani Patrol". Westminster Gazette. Burnham, Frederick Russell (1899). "Northern Rhodesia". In Wills, Walter H (ed.). Bulawayo Up-to-date; Being a General Sketch of Rhodesia . London: Simpkin, Marshall, Hamilton, Kent & Co. pp. 177–180. Burnham, Frederick Russell. "Scouting on Two Continents (Typescript, n.d)". Frederick Russell Burnham Papers, 1864–1951 (inclusive). Manuscripts and Archives, Yale University. mssa.ms.0115. Box 14, Folders 1–4. Burnham, Frederick Russell (1944). Taking Chances. Los Angeles: Haynes. ISBN 978-1-879356-32-0. OCLC 2785490. Burnham, M. Howard (1912). Modern Mine Valuation. London, C. Griffin and Company, limited. ISBN 978-1-151-74631-3. Burnham, Roderick Henry (1884). Genealogical Records of Thomas Burnham, the Emigrant, who was Among the Early Settlers at Hartford, Connecticut, U.S. America, and His Descendants. Hartford, Connecticut: Case, Lockwood & Brainard Co.
Brown, Curtis (November 1901). "Burnham, the Scout". Pearson's Magazine: 546–553. hdl:2027/nyp.33433081664249. OCLC 1645313. Carr, Harry (September 6, 1931). "They Knew the Old California Bandits". Los Angeles Times. ISSN 0458-3035. Coates, Peter A (2007). American Perceptions of Immigrant and Invasive Species: Strangers on the Land. Berkeley: University of California Press. ISBN 978-0-520-24930-1. Colby, William E.; Olmsted, Frederick Law (April 1933). "Borrego Desert Park". Sierra Club Bulletin. XVIII. Retrieved June 15, 2013. Cubé, Caroline. "Finding Aid for the W.W. Hodkinson Papers, 1881–1971". University of California Los Angeles, Special Collections, Young Research Library. Retrieved June 28, 2013. Davis, Clark (2001). Company Men: White-Collar Life and Corporate Cultures in Los Angeles, 1892–1941. Baltimore, MD: Johns Hopkins University Press. ISBN 978-0-8018-6275-5. Davis, Richard Harding (1906). "Chapter VI. Major Burnham, Chief of Scouts". Real Soldiers of Fortune . New York: Charles Scribner's Sons. ISBN 978-0-87364-239-2. DeGroot, E. B. (July 1944). "Veteran Scout". Boys' Life. Donovan, Charles Henry Wynne (1894). With Wilson in Matabeleland, Or, Sport and War in Zambesia. London: Henry and Company. ISBN 978-0-86920-180-0. Du Toit, Stefanns Jacobus (1897). "How Wilson And His Men Perished". Rhodesia, Past and Present. Ehrenclou, V. L (May – June 1925). "Major Burnham — The Scout". Union Oil Bulletin: 1–11, 19. OCLC 12064434. Elliott, John (2004). "King of Scouts Honored at Gravesite". Kaweah Commonwealth Online. Archived from the original on June 6, 2012. Retrieved June 23, 2013. Everett, Mary Nixon (July – August 1952). "Dedication of Mount Burnham". The Masterkey. 26 (4). Farwell, Byron (March 1976). "Taking Sides in the Boer War". American Heritage Magazine. 20 (3). ISSN 0002-8738. Retrieved June 26, 2013. Fisher, Claude (January 5, 1930). "When " B.-P." Was Nearly Killed". Daily Mail (1086). London. ISSN 0307-7578. Fleming, Mike. "RatPac, Edward Norton's Class 5 Options 'American Hippopotamus'". Deadline Hollywood. Retrieved June 5, 2014. Forster, Reverend Dr. Michael. "The Origins of the Scouting Movement" (DOC). Netpages. Retrieved July 21, 2013. Forbes, Archibald; Griffiths, Arthur; Henty, George Alfred; Knight, E. F. (1896). Battles of the Nineteenth Century. London: Castle and Company Ltd.
Fort, Charles; Liveright, Horace (1919). The Book of the Damned. New York: Horace Liveright. chap. XI. ISBN 978-1-870870-53-5. Gann, Lewis H (1965). A history of Southern Rhodesia; early days to 1934 (First ed.). London: Chatto & Windus. ISBN 978-0-85664-771-0. Gooding, W L (July 10, 1894). "A Ride for Life". Grey River Argus. XXXVI (7, 986). Haggard, H. Rider (1896). The Wizard. New York, London: Longmans, Green. ISBN 978-1-84677-796-7. Haggard, H. Rider (1926). The Days of My Life Volume II. London: Project Gutenberg of Australia. Retrieved June 15, 2013. Hales, A. G. (November 13, 1900). "Anglo-African Writers: Letter to Major Burnham from Lord Roberts". The Daily News (17048). Hamilton College, ed. (1874). "Obituary Record for 1873-4". 63rd Annual Catalogue of the Officers and Students of Hamilton College, 1874-75. Clinton, NY: Roberts & Co.
Hammond, John Hays (January – June 1921). "South African Memories: Rhodes — Barnato — Burnham". Scribner's Magazine. LXIX: 257–277. Hemingway, Ernest; Hotchner, A. E (2005). Dear Papa, Dear Hotch: The Correspondence of Ernest Hemingway And A. E. Hotchner. Columbia, Missouri: University of Missouri Press. ISBN 978-0-8262-1605-2. Hensman, Howard (1900). A History of Rhodesia, Compiled from Official Sources (PDF). Edinburgh and London: W. Blackwood and Sons. Retrieved June 8, 2012. Holder, Charles (September 10, 1910). "The Esperanza Stone". Scientific American. 103 (11): 196. doi:10.1038/scientificamerican09101910-196. Homans, James E., ed. (1918). "Burnham, Frederick Russell" . The Cyclopædia of American Biography. New York: The Press Association Compilers, Inc. pp. 249–251. OCLC 81277904. Hough, Harold (January 2010). "The Arizona Miner and Indiana Jones". Miner News. Archived from the original on December 27, 2009. Retrieved August 10, 2013. Jeal, Tim (1989). Baden-Powell: Founder of the Boy Scouts. London: Hutchinson. ISBN 978-0-09-170670-8. Juang, Richard M (2008). Africa and the Americas: culture, politics, and history : a multidisciplinary encyclopedia, Volume 2 Transatlantic relations series. Santa Barbara, California: ABC-CLIO. ISBN 978-1-85109-441-7. Kemper, Steve (2016). A Splendid Savage: the Restless Life of Frederick Russell Burnham. New York: W. W. Norton. ISBN 978-0393239270. Leebaert, Derek (2006). To Dare and to Conquer: Special Operations and the Destiny of Nations. New York: Little, Brown. ISBN 978-0-316-14384-4. Lott, Jack (1972). "Burnham, Chief of Scouts". In Bell, E.G. ; Lott, Jack; James, Garry (eds.). Guns & Ammo 1973 Annual. Los Angeles: Peterson Publishing Co. OCLC 27427113. Lott, J. P. (September 1976). "Major F R Burnham, DSO: A Vindication". Rhodesiana (35). ISSN 0556-9605. OCLC 1904759. Lott, J. P. (March 1977). "Major F. R. Burnham, D.S.O". Rhodesiana. 36. ISSN 0556-9605. OCLC 1904759. MacKenzie, John M. (1986). Imperialism and Popular Culture. Manchester, UK: Manchester University Press. ISBN 978-0-7190-1868-8. Marston, Roger (January 2010). Own Goals – National pride and defeat in war: the Rhodesian experience. Northampton: Paragon Publishing. ISBN 978-1-899820-81-8. McClintock, Rev. John, ed. (1885). Cyclopedia of Biblical, theological, and ecclesiastical literature: Vol 1 A-CN. New York: Harper & Brothers. Miraldi, Robert (2003). The Pen is Mightier; the Muckraking Life of Charles Edward Russell. New York: Palgrave Macmillan. ISBN 978-0-312-29292-8. Money, R. R. (August 1962). "Epic of Africa". Blackwood's Magazine. v291: 42–52. ISSN 0006-436X. Money, R. R. (January 1962). "The Greatest Scout". Blackwood's Magazine. v292: 169–82. ISSN 0006-436X. Money, R. R. (April 1962). "The Tonto Basin Feud". Blackwood's Magazine. 291. ISSN 0006-436X. Montgomery, Ruth (1967). A Search for the Truth. New York: Fawcett Crest. ISBN 978-0-449-21085-7. Nash, Gerald (July 1980). "The Census of 1890 and the Closing of the Frontier". The Pacific Northwest Quarterly. 71 (3). Osborn, Henry Fairfield (June 29, 1933). "Serbelodon Burnhami, a new Shovel-Tusker from California" (PDF). American Museum Novitates (639). Retrieved June 14, 2013. O'Reilly, John (1970). Pursuit of the king: an evaluation of the Shangani Patrol in the light of sources read by the author. Bulawayo: Books of Rhodesia. ASIN B005TAHXR4. Pakenham, Thomas (1979). The Boer War. New York: Random House. ISBN 978-0-394-42742-3. Pegler, Martin (2004). Out of nowhere : a history of the military sniper. Oxford: Osprey. OCLC 56654780. Peterson, Robert (March – April 2004). "Baden-Powell's First Scouting Books". Scouting Magazine. Retrieved July 31, 2013. Pietrusza, David (2007). 1920: the year of the six presidents. New York: Carroll & Graf. OCLC 77523663. Plaster, John (2006). The Ultimate Sniper: An Advanced Training Manual for Military and Police Snipers. Boulder, CO: Paladin Press. ISBN 978-0-87364-704-5. Poyer, Joe (2013). Collecting the American Sniper Rifle 1900 to 1945. Tustin, California: North Cape Publications. ISBN 978-1-882391-47-9. Prichard, Hesketh Vernon Hesketh (1919). Sniping in France, 1914–18: With Notes on the Scientific Training of Scouts, Observers, and Snipers. Solihull, West Midlands, England: Helion. ISBN 978-1-874622-47-5. Retrieved June 29, 2013. Roosevelt, Theodore (1917). The Foes of Our Own Household. New York: George H. Doran. p. 347. LCCN 17025965. Russell, Charles Edward (1941). A pioneer editor in early Iowa : a sketch of the life of Edward Russell. Washington, DC: Ransdell Inc. OCLC 612420422. Saxton, Edward H. (March 1978). "Saving the Desert Bighorns". Desert Magazine. 41 (3). Retrieved June 29, 2013. Shippey, Lee; A. L. Ewing (1930). "Frederick Russell Burnham". Folks Ushud Know; Interspersed with Songs of Courage. Sierra Madre, California: Sierra Madre Press. pp. 23–25. OCLC 2846678. Shippey, Lee (February 2, 1930). "Lee Side o' L.A.: Personal Glimpses of Famous Southlanders". The Los Angeles Times. ISSN 0458-3035. Selous, Frederick Courteney (1896). Sunshine and Storm in Rhodesia; being a narrative of events in Matabeleland both before and during the recent native insurrection up to the date of the disbandment of the Bulawayo field force. London: R. Ward. ISBN 978-1-60355-059-8. Retrieved July 28, 2013. Smylie, James Hutchinson (1996). A Brief History of the Presbyterians. Louisville, Kentucky: Geneva Press. OCLC 34926798. Strasser, Mike (October 4, 2007). "Best Warrior Competitor Continues Family Tradition of Military Excellence". United States Army. Retrieved June 19, 2013. Thrapp, Dan L. (1991). "Encyclopedia of Frontier Biography: A-F". Encyclopedia of Frontier Biography. Lincoln, NE: University of Nebraska Press. ISBN 978-0-8032-9418-9. Tough, Alistair (1985). "Papers of Frederick R. Burnham (1861–1947)". History in Africa. 12: 385–387. doi:10.2307/3171734. ISSN 0361-5413. JSTOR 3171734. Unger, Frederic William (1901). "XXV". With "Bobs" and Krüger: Experiences and Observations of an American War Correspondent in the Field with both Armies. Philadelphia: H. T. Coates. Wagner-Martin, Linda (2000). A historical guide to Ernest Hemingway. New York: Oxford University Press. ISBN 978-0-19-512152-0. Weideman, Christine (2006). "Guide to the Frederick Russell Burnham Papers". Yale University Library. Archived from the original on September 6, 2006. Retrieved June 14, 2013. West, James E.; Lamb, Peter O. (1932). He-who-sees-in-the-dark; the Boys' Story of Frederick Burnham, the American Scout. illustrated by Lord Baden-Powell. New York: Brewer, Warren and Putnam; Boy Scouts of America. West, James E. (1937). 10108 H.doc.18. Washington, D.C.: United States Congress, House Committee on Education. West, James E. (1935). "Pioneer Trails in Books". Religious Education (July/Oct). Wills, W. A.; Collingridge, L. T. (1894). The Downfall of Lobengula: the Cause, History, and Effect of the Matabeli War. London: The African Review. ISBN 978-0-8371-1653-2. Wilson, James Grant; Fiske, John (1900). Appletons' Cyclopædia of American Biography. New York: Gale Research. p. 249. ISBN 978-1-85506-957-2. Wood, Clement (1932). The Man Who Killed Kitchener: the Life of Fritz Joubert Duquesne. New York: W. Faro. OCLC 1071583. Woods, Douglas; Melba Levick (2012). The California Casa. New York: Rizzoli; Enfield: Publishers Group UK Books. ISBN 978-0-8478384-9-3. OCLC 766319986. "American Scout Escapes". The Atlanta Constitution. April 8, 1900. ISSN 0093-1179. "Animals from Africa: Maj Burnham Will Import Wild Beasts for Western Plains". The Washington Post (reprint from New York Herald). March 3, 1911. ISSN 0148-2076. "Arizona National Wildlife Refuges". Arizona Highways. 17. 1941. ISSN 0004-1521. "Boy Scouts & Cub Scouts Celebrate Anniversary". City of Fulton. Archived from the original on April 13, 2014. Retrieved June 24, 2013. "Burnham's Services Brought to the Attention of Parliament: He Maintains His Well-known Modesty. His Injuries Received in Africa. Now Living in a London Suburb". The Los Angeles Times. March 2, 1902. ISSN 0458-3035. "Californians Develop Venezuela Oil Fields". Los Angeles Times. June 19, 1927. ISSN 0458-3035. "Chief of Scouts Major Burnham's Adventures". The Times (44450). London. December 9, 1926. "Classified Advertising". The Times. London. April 29, 1899. "Death of a Rhodesian Pioneer". Lloyd's Weekly Newspaper. October 1, 1899. "Dominguez Oil Field Redevelopment: Exploration and Production" (PDF). Los Angeles County Economic Development Corporation. 2010. Retrieved August 29, 2013. "The Duquesne Spy Ring". Federal Bureau of Investigation. Archived from the original on September 30, 2013. Retrieved June 12, 2013. "Ecclesiastical and Clerical". New York Evangelist. 26 (15). April 11, 1855. .
"England's American Scout" (PDF). New York Times via London Chronicle. May 5, 1901. ISSN 0362-4331. Retrieved June 22, 2013. "Enroll Westerners for Service in War; Movement to Register Men of That Region Begun at the Rocky Mountain Club. Headed by Major Burnham. John Hays Hammond and Others of Prominence Reported to be Supporting Plan" (PDF). New York Times. March 13, 1917. Retrieved June 30, 2013. "Eulogies of Baden-Powell". New York Times. May 19, 1900. ISSN 0362-4331. "The Fauna of the British Empire". Science. 71 (1838): 308. March 21, 1930. doi:10.1126/science.71.1838.308. JSTOR 1654708. "Feature Detail Report: Mount Baden-Powell". United States Geological Survey. July 9, 2013. Retrieved July 9, 2013. "Feature Detail Report: Mount Burnham". United States Geological Survey. July 3, 2013. Retrieved July 3, 2013. "Finest Hour" (PDF). Journal of the Churchill Center and Societies, Summer 2005. Archived from the original (PDF) on August 8, 2007. Retrieved June 16, 2013. "First Scouting Handbook". Order of the Arrow, Boy Scouts of America. 2013. Retrieved July 31, 2013. "Great Canadian Heritage Discoveries". Biographical sketch. The Canadian Anglo-Boer War Museum. 2007. Archived from the original on March 12, 2007. Retrieved March 31, 2007. "Guarding Morgan Mines: Burnham's Force also at Guggenheim Properties is report" (PDF). New York Times. April 23, 1912. ISSN 0362-4331. Retrieved September 28, 2007. Handbook for Boys (3rd ed.). New Brunswick, NJ: Boy Scouts of America. 1933. "Killed the Matabele God: Burnham, the American Scout, May End Uprising" (PDF). New York Times. June 25, 1896. ISSN 0093-1179. Retrieved June 26, 2013. "London Gazette". London Gazette (27146). London: T. Neuman. December 22, 1899. p. 8541. ISSN 0374-3721. Retrieved June 14, 2013. "Maj. Burnham and Family Depart for Africa: Angelenos to Tour World". The Los Angeles Times. May 14, 1929. ISSN 0458-3035. "May Import African Animals to Solve Meat Problem" (PDF). New York Times. April 17, 1910. Retrieved September 28, 2007. "More South African Honors: Lady Sarah Wilson and Major Burnham, the American Scout, among those decorated" (PDF). New York Times. September 28, 1901. ISSN 0362-4331. Retrieved June 29, 2013. "NAACP Founder Charles Edward Russell". Library of Congress. Archived from the original on May 24, 2013. Retrieved August 11, 2013. "NCO and Soldier of the Year Competition: 2003 Winners". United States Army. 2004. Archived from the original on April 19, 2006. Retrieved June 19, 2013. "A New Eldorado: Discoveries in West Africa by Major Burnham, England's American Scout" (PDF). New York Times (London Mail). August 12, 1901. ISSN 0362-4331. "On My Honor". LDSfilm. August 18, 2004. Retrieved June 25, 2013. "Pathetic Loss". The Western Times (17550). Exeter, England. October 4, 1905. "Personal". Illustrated London News (3273). London. January 11, 1902. Retrieved August 30, 2012. "Plane Line Saves Weeks: American Air Service in Guatemala Carries Odd Passenger List over Hard Country". New York Times. January 17, 1932. ISSN 0362-4331. "The Pulitzer Prizes". The Pulitzer Prizes – Columbia University. 2013. Retrieved August 11, 2013. "Rider Haggard's Tribute". Atlanta Constitution. November 21, 1896. ISSN 0093-1179. Press Reference Library: Notables of the West. New York: International News Service. 1915. OCLC 5532411. "Scientific Notes and News". Science. 71 (1847): 533–536. May 23, 1930. Bibcode:1930Sci....71..533.. doi:10.1126/science.71.1847.533. ISSN 0036-8075. JSTOR 1655718. Southern Africa Committee (1973). "Film". Southern Africa. 6. ISSN 0038-3775. OCLC 1781212. "Silver Buffalo Award Winners 1939–1930". Boy Scouts of America. 2012. Retrieved June 23, 2013. "Southern California by Towns and Counties: Fred Burnham now a Major in British Army; Recovering from His Injuries". Los Angeles Times. Los Angeles: Times-Mirror Co. August 4, 1900. ISSN 0458-3035. "Railway And Other Companies: Northern Territories (B.S.A.) Exploring Company Limited". The Times (35824). London: R. Nutkins. May 9, 1899. ISSN 0140-0460. "Roosevelt's Army Has Not Lost Hope; Colonel's Aids from All over the Country Meet and Leave the Future in His Hands" (PDF). New York Times. May 20, 1917. ISSN 0362-4331. "Scouting History". 1st Lacock Scout Group. 2013. Retrieved July 21, 2013. "Will Not Send Roosevelt; Wilson Not to Avail Himself of Volunteer Authority at Present". New York Times. May 19, 1917. ISSN 0362-4331. "A Young South African". The Los Angeles Times. June 6, 1896. ISSN 0458-3035. Frederick Russell Burnham Papers. Manuscripts and Archives, Yale University at the Wayback Machine (archived September 10, 2006). A large collection of Burnham's documents: Correspondence, 1864–1947. Subject Files, 1890–1947. Writings, 1893–1946. Personal and Family Papers, 1879–1951. Photographs, ca. 1893–1924. Frederick Russell Burnham Papers, 1879–1979, Hoover Institution Library and Archives, Stanford University. Another large collection of Burnham's documents: Correspondence, speeches and writings, clippings, other printed matter, photographs, and memorabilia, relating to the Matabele Wars of 1893 and 1896 in Rhodesia, the Second Boer War, exploration expeditions in Africa, and gold mining in Alaska during the Klondike gold rush.